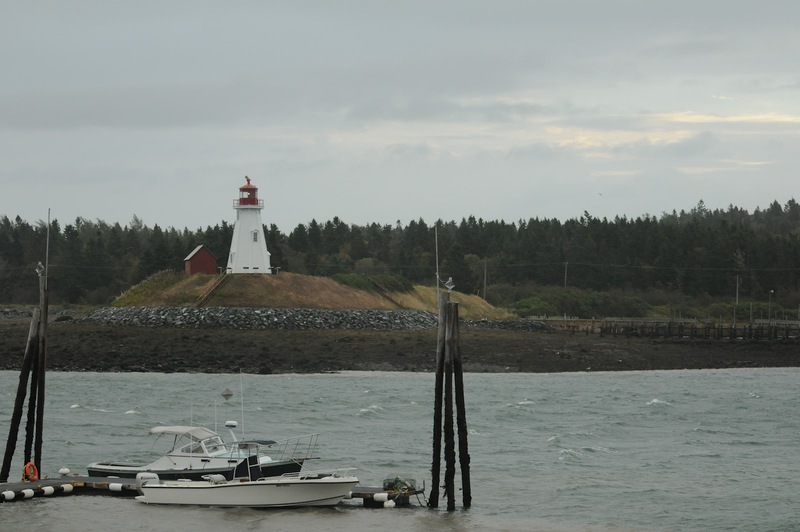 Today, there is a gale warning in effect for our region. The current marine forecast is: "Wind south 25 to 35 knots, diminishing to northwest 15 to 20 knots this afternoon, then veering northerly 20 to 25 knots near midnight." We've been experiencing gusts from 25-38 mph since last night! As if that wasn't enough to keep us out of the Bay, there was a torrential downpour this morning that lasted for hours. Plenty of whitecaps this morning. When the crew wakes up at 5 AM in September, it feels like the dead of night. It is much colder than any August morning, and the sun doesn’t appear until around 6 AM. Yet we were thrilled to get an early wake-up call on September 12, after four consecutive days on shore. The winds had settled from the passing weather systems, and there was no fog in sight. The R/V Nereid headed out at 6:15 AM hoping to find more right whales. The first whales we encountered were Catalog #3390 and her calf. Her calf might be the best documented baby right whale, ever. Despite the fact that we have seen them regularly this season, we still enjoy photographing and watching the pair. Seeing a healthy mom and calf in the Bay of Fundy is an encouraging sight when working with a critically endangered species. Later in the day, we came across two more right whales that we haven't seen yet this season- Catalog #1332 and #1981. Both individuals had sloughing skin on their heads, but #1332 (named "Dollar" for a scar on his head that looks like dollar sign) had significant coverage on his head and body. The skin of a right whale sloughs off pretty easily, and with a 2 cm skin layer, they have a lot to spare! New England Aquarium researchers use the condition of the skin as one of the parameters to visually measure a whale’s over-all health. Skin will come off naturally if an individual breaches or rubs against another individual. However, when the sloughing of the skin is excessive, lesions appear on the skin, and/or orange cyamids are present (as opposed to white cyamids), it is possible that the whale is less healthy than usual. Before drawing conclusions though, it's important to look at the other parameters for a health assessment, which are: the body condition (the fatter, the better! ), rake marks (two or more parallel lines) around the blowholes, and cyamids around the blowholes. While Dollar still looks plump, he is exhibiting some minor rake marks by his blowholes in addition to the skin sloughing. Perhaps Dollar's health will improve during his time in the Bay of Fundy. The mud on his head is an indication that he's going down to the seafloor to feed, so maybe he just needs a few good meals! Hopefully our team and other research teams will see him often during surveys this fall and winter so that we can monitor his health. We saw several other species during our survey. Near the end of the day, we spotted a pair of humpback whales and many fin whales. We spent some time watching a group of five fin whales traveling together, which is always a treat. Fin whales are the second largest animal ever to live on earth, next to the blue whale. There was plenty of bird life as well, including puffins, shearwaters, phalaropes and storm petrels. Hopefully the chilly September weather will attract more right whales to the Bay. Last year, the field season ended with lots of whales after a quiet August. Perhaps as the weather cools down, the whale activity will heat up! Check out Maria's first blog! Fishing weirs have been used in North America as a means capturing many different fish species for thousands of years. In Boston's Back Bay, remnants of fishing weirs thought to be about 2000 years old have been uncovered during various construction projects. Today, fishing weirs are still a widely used means of fishing in many parts of the world. 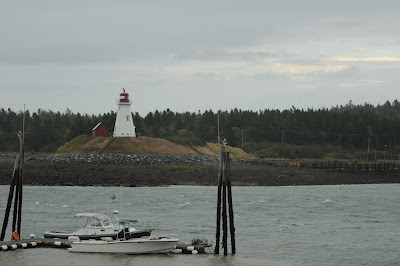 In British Columbia, salmon is the target fish, while in Nova Scotia, weirs are used to catch shad. 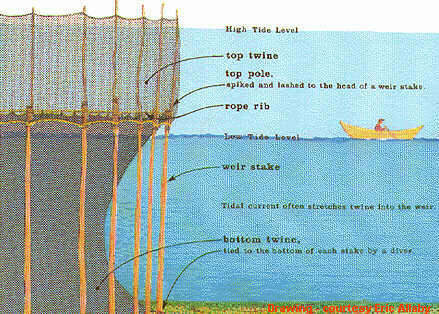 In simple terms, a weir is a fish trap made of a series of wooden stakes with twine stretched between each stake to catch fish, but water is allowed to pass through freely. Weirs are built in tidal areas, so they are a perfect and efficient match for the Bay of Fundy! 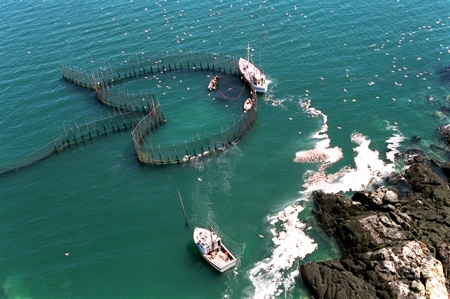 In most of the Bay, the target fish is herring (although flounder and mackeral are targeted in other parts of the Bay). Herring move to the surface and inshore at night. 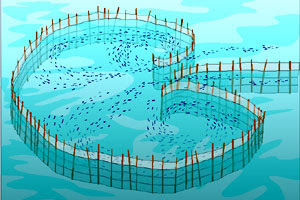 The weirs have a "fence" that direct the herring into opening of the weir, where the fish begin to swim in a circular or figure-8 pattern which always directs them away from the opening. Unable to exit, the fish are eventually collected from the weir using a purse seine which draws fish to the surface and collects them into a condensed group when the net is pulled tighter (or pursed). Herring is an important commercial fishery in the Bay of Fundy and is sold in many different forms. Herring can be consumed fresh, but can also be smoked and sold as Kippers. In the Atlantic, sardines sold in cans are simply a small herring. In addition, herring is used for bait for other commercial fisheries, such as crab and lobster, as well as being used in feed for pets, livestock, aquarium and aquaculture fish. Even the scales of herring (called "pearl essence") have been found useful by both the paint and cosmetic industries. On occasion, cetaceans might enter the weir (here in the Bay of Fundy, it's usually harbor porpoise) and feed on the schooling herring. However, just like how the herring cannot find their way out once entering the weir, cetaceans can also find themselves in the same predicament. In 1991, the Grand Manan Whale and Seabird Research Station (GMWSRS) began a harbor porpoise release program to assist local fisherman with the safe release of porpoise found in their weirs. 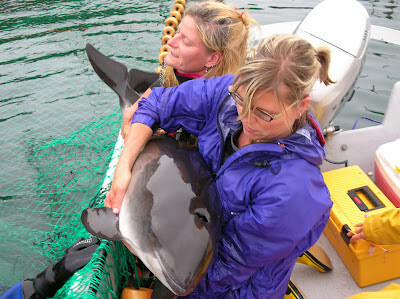 Since the start of the program, they have successfully released over 700 porpoise from the weirs around Grand Manan! The GMWSRS Harbor Porpoise Release Program Team successfully releasing a harbor porpoise. On Saturday August 25th, GMWSRS received a call about a large whale (based on the description, possibly a right whale mom and calf pair) that was spotted in a herring weir on the western side of Grand Manan Island. On this particular day we were not on the water running our usual surveys in the Bay. Since the location of the weir made it much easier for us to respond from our port of Lubec than for other vessels out in the Bay to respond, we were asked to confirm and document the presence of an animal in the weir, and to identify the species. We decided to take our faster research boat, Callisto, since it was late in the day and and she could make the 13 mile trip in half the time the Nereid could. As I set out on the Callisto with Marianna and Meagan, I began to wonder about all the possible things that could be in the weir. Could it be a really large minke whale? Maybe even a basking shark? I figured it could also be humpback whale, since it had happened before... but I also knew of a couple past cases where right whales had entered weirs. As we cleared West Quoddy on that gorgeous Saturday afternoon I wondered.....could we actually be heading to a right whale entrapped in a weir?